The way our team has clicked is unbelievable. Honestly, it was like a brotherhood right off the bat. Out here there are plenty of stressful conditions, and 10 different ways to do everything. Instead of getting into a scuffle about how something should be done, we brainstorm and come up with the best solution together. We’ve developed a tremendous amount of mutual trust and respect over a short period of time. It’s a very good thing we get along so well when you consider our lodging arrangements- which I’d compare to a glorified deer camp. We each have our own cot in a 20-foot by 20-foot room. Thankfully, we are all pretty neat and respect each other’s space. Having such tight living quarters really hasn’t been an issue- except at night. If you happen to wake-up in the middle of the night, you get the privilege of listening to what I call the “snoring symphony.” It’s pretty hilarious to hear everyone snoring in a different key at the same time. It gets dark around 6 p.m. and that’s when we usually head back to “camp.” After supper, we spend the evening talking and reminiscing about the day. One of the reoccurring themes in our conversations is how this project would be considered virtually impossible by standards back home. The terrain that has to be crossed in order to connect the wire from one pole to another is insane. But the locals are determined and they do whatever it takes to make it happen, scaling dangerous slopes and hacking down trees along the way. It just goes to show that where there’s a will, there’s a way. It’s nothing short of amazing what people can accomplish when they come together for a common purpose. 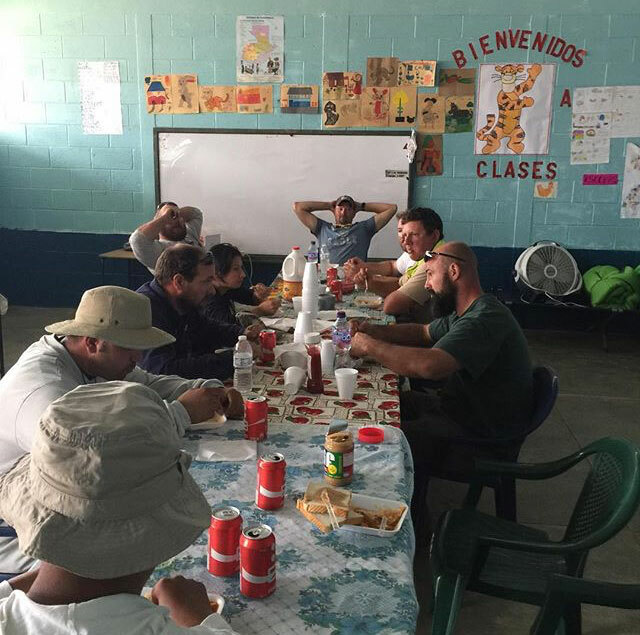 -Contributed by Wolverine lineworker, Bill B.
Wow looking at this picture of you sitting down for a meal, I see tired, but satisfied faces!! Good luck to you all, and keep it safe!! We are all very proud of each and every one of you!! You guys are amazing! I am so excited to get the updates each day to see how things are progressing. Totally in awe of all of you AND the villagers! Keep up the good work and thanks for sharing it with all of us. How about some more pictures of the local crew doing what they are doing to help you guys out. It is amazing that a band of brothers like you guys have become can sit down and put your heads together to fine a solution to whatever problem you are incurring, kudos to you all you’re making a difference. There is no suprise to hear that you have become a strong team. Keep working safe and drinking plenty of fluids. Watch out for each other. Thanks for being ambassadors for our Co-ops. We are very proud of you guys! This is an experience you will never forget and the people will be forever greatful! I see a lot of talent and determination sitting at that table. Keep up the great work! Enjoying reading about your journey. Keep the updates coming. Stay safe and can’t wait to hear all the experiences when you get home. Bill, you guys make it look and sound easy where it obviously is not. Having a crew who can not just “get along’ but also even enjoy the work and camaraderie in such adverse condition says a lot about the character accompanying the talent. Keep up the good work – and stay safe.